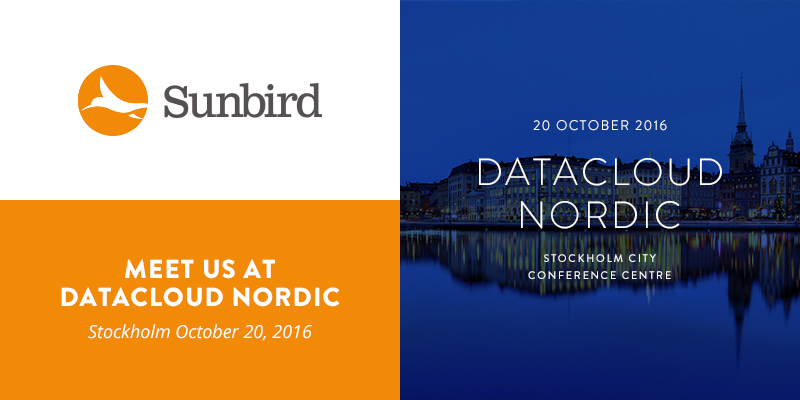 Sunbird is thrilled to be participating as an Industry Sponsor at Datacloud Nordic at the Stockholm City Conference Centre in Stockholm, Sweden on Thursday, October 20, 2016. Stop by Pod 27 on the exhibition floor to meet with our European Sunbird representatives and get a sneak peek at the new features in the upcoming release of our Data Center Infrastructure Management (DCIM) software. This year’s Datacloud Nordic conference aims to explore the very latest in technologies and markets, offer inspiring insights and thought-provoking points of view for companies seeking a better way of hosting and colocating in the new reality of a data-driven, cloud-connected, machine-led world. The one-day industry event will include an impressive line-up of guest speakers from leading Nordic and international players. During the Datacloud Nordic 2016 conference, Sunbird, together with our strategic alliance partner Raritan, Inc., will be demonstrating how DCIM software can truly add value to Raritan’s multiple, award-winning rack power solutions. Targeted at senior executives in the data center, hosting and cloud industries, enterprise end users, investors, infrastructure and technology providers, Datacloud Nordic will deliver a rich and innovative program of keynotes, panel sessions, workshops and product demonstrations offering a complete view of the market, its developments, new solutions, trends, and innovations. You won’t want to miss this event! Heading the Datacloud Nordic 2016 conference and want to chat one-on-one with a DCIM expert? Sunbird representatives will be available for individual meetings to help you explore if DCIM is right for you. Let us know if you’d like to meet.